Michael Flynn Case: Is a Guilty Plea Withdrawal in the Works? Recent developments in the Michael Flynn case are prompting speculation among legal experts that his defense team could withdraw his guilty plea for lying to the FBI. Last Friday, Judge Emmet Sullivan, the judge presiding over the case, ordered the special counsel to turn over to the Flynn defense team any “exculpatory” evidence — or evidence suggesting that Flynn might be innocent — in their possession. Sullivan also ordered the special counsel to turn over to the court all information favorable to Flynn — regardless of whether they believed it was “material” to the case — so that the court could decide whether it was material or not. The order itself was not unusual. In fact, Sullivan has entered similar orders for many years in every criminal case he’s handled, and he noted in a court order that an earlier version of the order had been inadvertently ordered in December. However, legal experts say what is significant is that along with the revised order, Sullivan added a long footnote that specifically walks through the analysis supporting the view that exculpatory evidence must be provided during plea negotiations, and that case law makes clear that a plea can be withdrawn if not. “The footnote is key because it basically walks through the case law to support that conclusion,” she said. Cleveland further explained that the lower courts are divided on whether the withholding of exculpatory evidence would be a basis for withdrawing a guilty plea. “That footnote explains why Judge Sullivan is on the side of ‘yes,’ and the cases he cites and walks through counter the Fifth Circuit footnote at the end which held to the contrary,” she said. Sullivan’s order was not the only interesting recent development in Flynn’s favor. His revised order came just two days after the special counsel and Flynn defense team submitted a protective order to the court that set limits on how to use any new evidence the special counsel may produce. The order said any new evidence turned over by the special counsel could only be used for Flynn’s defense and not in any other proceeding. There were also rules on handling any sensitive material the special counsel might produce. The protective order was interesting for two reasons. One, it suggested that the defense team might be considering withdrawing Flynn’s guilty plea. As part of the plea deal entered into on December 1, 2017, the defense had already agreed to Mueller’s demand to waive the “right to any further discovery or disclosures of information not already provided,” as Andrew McCarthy, former U.S. assistant attorney and contributing editor at the National Review, noted in a recent piece. Two, it suggested that new evidence that could help Flynn might be forthcoming. “With the protective order in place dictating the terms of any new evidence found, Flynn’s defense team should start receiving the required disclosures from the special counsel’s office, and “there is reason to believe these will include some bombshells,” Cleveland wrote. Both sides recently told the court they are not ready to schedule a sentencing hearing for Flynn. The special counsel was due to deliver a status report on Flynn’s case to the court on February 1, but both sides asked for a delay until May 1. Journalists have, in recent weeks, suggested that there is indeed new exculpatory evidence, such as the FBI agents’ interview with Flynn on January 24, 2017, when they reportedly believed he had not lied or misled them intentionally. To recap, the agents had interviewed him after then-Acting Attorney General Sally Yates allegedly became concerned about the incoming national security adviser’s conversations with Russian Ambassador to the U.S. Sergei Kislyak — which were being surveilled. After those conversations were leaked to the Washington Post, incoming Vice President Mike Pence said in an interview that Flynn had not spoken about sanctions with Kislyak. Even though the FBI reportedly found nothing illicit in Flynn’s calls, Yates said she became concerned that Flynn had lied to Pence and could be vulnerable to blackmail by the Russians, and she sent two FBI agents down to the White House to interview Flynn. She later would say she was concerned that Flynn was violating the Logan Act — an obscure law that criminalizes negotiation by unauthorized persons with foreign governments. However, that justification could also mask the real reason she sent agents to interview Flynn — to catch him in a lie and get him expelled from the White House. But last Monday, Washington Examiner Chief Political Correspondent Byron York reported that former FBI Director James Comey told lawmakers in March 2017 that the FBI agents who interviewed Flynn on January 24, 2017 — Peter Strzok and a colleague — did not believe that Flynn had lied to them or that any inaccuracies in his answers were intentional. York noted congressional investigators are “baffled” over why the special counsel team, nine months later, would charge Flynn with lying to those FBI agents. McCarthy also found the about-face odd as well. He suggested that perhaps Flynn was charged with lying after the FBI agents found him truthful due to Mueller’s “very aggressive prosecutors.” “Did they decide they knew better than the experienced investigators who were in the room observing Flynn’s demeanor as he answered their questions?” he wrote. He also wondered whether the special counsel had told Flynn’s defense team that Strzok and his colleague believed that Flynn did not lie — which would qualify as exculpatory evidence. As to why Flynn might have pleaded guilty if he was not guilty, McCarthy suggested it was because Flynn was under severe financial strain or because he wanted to protect his son, who was also in Mueller’s crosshairs. A report weeks ago by investigative journalist Sara Carter hinted at what might have happened. Carter reported on January 29, 2018 — the day after former FBI Deputy Director Andrew McCabe stepped down — that there were “indicators” that McCabe had asked FBI agents to change their 302s, summaries of interviews with witnesses. She did not say whose 302s may have been changed. But Carter suggested that the Justice Department inspector general’s investigation into political bias at the FBI had something to do with it. The changing of 302s could amount to tampering of evidence and an obstruction of justice. “This is something the inspector general is investigating,” she said. Another recent report — if true — could shed further insight into what might have happened. Over the weekend, conservative blogger Mike Cernovich reported that McCabe had altered the 302 for the FBI agents’ interview with Flynn and deleted the history of all revisions. Huge scoop. Like my other big stories (Susan Rice, security clearances, Conyers) will take media a long time to confirm. You know how Peter Strzok’s system didn’t back up. You know why? McCabe altered his 302 of the Flynn interview, and deleted all history of revisions. The FBI cannot provide a *clean* history of revisions for the 302 interview with General Flynn. That’s why Judge Emmett Sullivan, who is very tough on unethical prosecutors, had ordered the Special Counsel to disclose exculpatory evidence, which would include these revisions. The IG knows McCabe changed Peter Strzok 302 / notes with General Flynn. Yet issuing a report to this effect would call thousands of FBI investigations into question. It’s full on freak-out mode, as no one know how to spin this. Why did a federal judge order Muller to disclose exculpatory evidence AFTER Flynn pled guilty? Do you know how unusual this is? Flynn waived the right to exculpatory evidence in his plea deal. That’s because the 302 was altered, and everyone knows it. Although Cernovich has been dismissed by some as a conspiracy theorist, he has broken several major stories that turned out to be true, including that former Obama National Security Adviser Susan Rice had unmasked Trump transition officials or requested the intelligence community reveal the identities of Trump transition officials who were caught up in U.S. intelligence collection. Cernovich’s tweets also suggested that the FBI may have also tried to hide or destroy Strzok’s text messages during the time period of the alleged act. DOJ Inspector General Michael Horowitz, who is investigating whether political bias affected the FBI’s investigations of Clinton’s private email server and the Trump campaign, found thousands of messages between Strzok and fellow FBI agent Lisa Page, who were having an extramarital affair. The Justice Department first said Strzok’s text messages from December 14, 2016, through May 17, 2017, were lost due to a technical glitch. That time period would have covered the date of his January 24, 2017, interview with Flynn. However, Horowitz announced he found them just days later. Breitbart News contacted Cernovich but was unable to reach him. Legal experts and journalists have also noted another oddity that could also bolster Flynn’s case — the judge that was initially assigned to the case, Judge Rudolph Contreras, was suddenly recused just days after Flynn had pled guilty. Contreras, McCarthy noted in his piece, is one of the 11 federal district judges assigned to the Foreign Intelligence Surveillance Court (FISC) — the same court that approved the surveillance warrants sought by the FBI in its investigation of the Trump campaign — meaning the FISA court is connected to Flynn’s case somehow. “There is cause to believe the FISA court was connected to the criminal charge filed against Flynn because Contreras, who recused less than a week after accepting Flynn’s guilty plea, ‘is one of just three FISA court judges who sits in the District of Columbia, where it is likely the Trump-Russia FISA warrants were sought,” Cleveland wrote. Last month, House Intelligence Committee Chairman Devin Nunes (D-CA), Senate Judiciary Committee Chairman Chuck Grassley (R-IA), and Crime and Terrorism Subcommittee Chairman Lindsey Graham (R-SC) revealed that the FBI had potentially committed violations in seeking FISA warrants on Trump campaign member Carter Page, such as leaving out that it was relying on a dossier paid for by the Clinton campaign and the Democratic National Committee. Jonathan Turley, George Washington University law professor and columnist, became the latest legal scholar questioning the charge against Flynn. 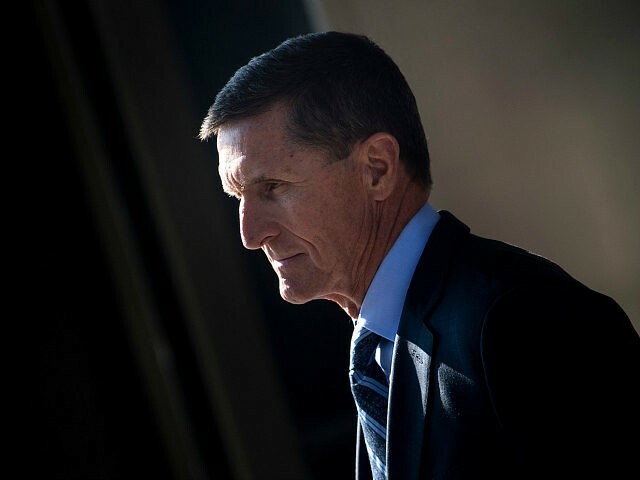 “The court order for Special Counsel Robert Mueller to share exculpatory evidence with former National Security Adviser Michael Flynn has raised intriguing questions about whether evidence might have been withheld from Flynn before his plea deal,” he wrote Thursday. He said Flynn withdrawing his plea deal — and therefore, not cooperating with the special counsel — could strengthen his case for a pardon. However, he also said while the new developments could give Flynn “buyer’s remorse” over his plea deal, he did not necessarily expect Flynn to withdraw his guilty plea. Doing so, he said, could prompt Mueller to go after Flynn harder, or perhaps go after his son again. “The danger of backing out of a plea can be easily seen in the expanding case against Trump’s onetime campaign chairman, Paul Manafort. Mueller has thrown every possible charge, short of ripping off a mattress label, at Manafort,” he wrote. “The threat from Mueller is obvious: Break the deal, face the wheel. Flynn could be hit with an indictment with more crimes and a co-defendant in the form of his son. In the end, Flynn still has few options that seem to run the gambit from ruin to near-ruin. He is currently at near-ruin,” he wrote.